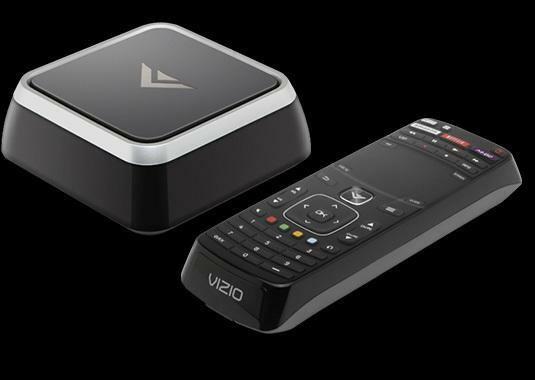 The VIZIO Co-Star Stream Player – VAP430 is an attractive and compact unit that packs a lot of features and functionality, including Google TV. Boy, am I ever behind the times when it comes to home entertainment technology. Most of my family, friends and co-workers have HDTV and have either replaced their cable subscription with a TV media player or are using a streamer in conjunction with their cable or satellite box to expand their viewing options. Me, I have a cable-ready TV that’s about seven years old hooked to a cable box with an expanded cable plan. And until recently, I didn’t even know a media streaming player existed. I decided I needed to start upgrading and my TV was the first to go. As a birthday present from me to me, I purchased a Google Smart TV. Next up on my upgrade plan was a TV media player. 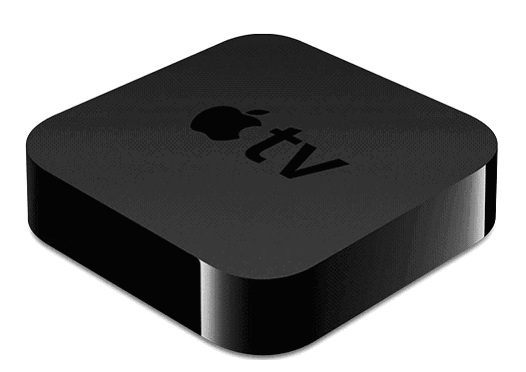 Over the past month or so, I browsed Amazon and read reviews on the many options available in streaming media players. I knew I needed a streamer with Google TV, which limited my options considerably. And since I had space limitations, I also needed a media streaming device that was compact. I found the perfect solution to my media player needs in the Vizio Co-Star. Just as its name suggests, the Vizio Co-Star Stream Player with Google TV co-stars perfectly with my new Google TV and enables me to stream all types of media. As an added bonus, it allows me to access videos, music and photos stored on my computer and flash drives. I never realized how much I could do with my TV with a media player attached to it. Plug in the HDMI output from my cable box into the HDMI input on the Co-Star. Connect the HDMI output from the Co-Star to my TV. Connect my Wi-Fi. (Or if you have an Ethernet cable, you would connect that). It was, as advertised, as simple as 1-2-3. Once I powered everything on, the On-Screen Set-Up Wizard Guide took over, smoothly handling specifications like screen sizing and networks, and guided me through syncing my other home network devices. It should be noted that the Co-Star media streamer is only compatible with high definition television with HDMI ports. Your TV should also have a resolution of 720p, 1080i, or 1080p. A great plus is that Vizio and Google automatically update the Co-Star with new software releases as they become available. Once the streamer is set up, take some time to check out the two-sided remote control. It has more programmability than I could ever image, including full function controls for TV, cable, DVR, surround sound system and video game consoles. Although I would have liked the remote to be backlit, any disappointment is forgotten with the QWERTY keyboard, touchpad and game control buttons on the remote’s backside. These features come in handy for typing in keywords when searching for programming, navigating the Co-Star menu functions and for playing video games. The front side of the remote contains all the traditional remote buttons. Another great feature of the remote control is its IR blaster functionality for controlling your television or other remote control devices by infrared, so it’s just a matter of pointing your remote at the device to operate it. As another bonus, the remote control uses Bluetooth technology so it not only communicates with the Co-Star, it also is compatible with your Bluetooth headphones, keyboard, or mouse. You also have the option of controlling the Vizio TV media player from your smartphone or tablet by downloading the Google TV remote control app. The Vizio Co-Star has nicely organized and colorful onscreen menus and easy navigation throughout the menu options. 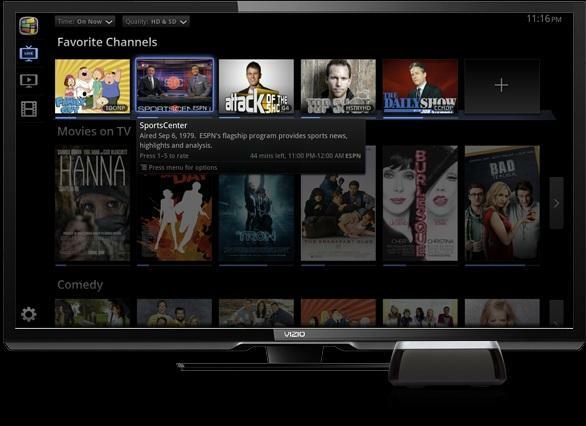 The main screen of the VIZIO Co-Star stream player is nicely navigated with a clean layout of the menu icons on the left side of the screen that connect you to a wealth of television programming, movies, music, your settings and more. The top of the On-Screen Menu includes icons that show your network status, the time of day and any waiting notifications. Next your Favorite Apps are displayed with a drop-down Category Selector menu, followed by All Apps including your Bookmarks and Downloads, Google Chrome, Google Play, the Vizio User’s Guide, the Search function, Settings and the TV Spotlight app. You can also create your own custom categories and arrange them as you prefer. he four main functions of the Vizio streamer are watching live TV or streaming entertainment, searching for programming, browsing the Internet and accessing Google Play apps. Simply use the remote’s touchpad to click on the icon that represents your viewing preference or use the keyboard and the Google Chrome browser to search for programming. With Vizio’s PlayPoint DLNA media streaming app, you can also let Co-Star search and play files stored on your home network via Wi-Fi, USB port, or Bluetooth. 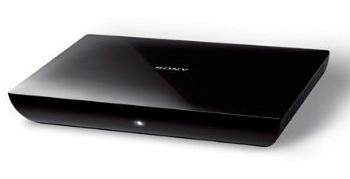 This allows you to view photos or videos or listen to music stored on other devices on your TV screen. 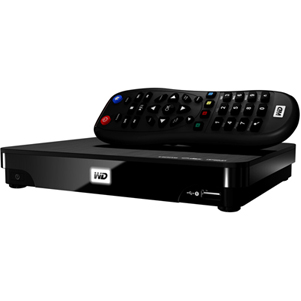 Because the VAP430 includes the Google TV platform, you can also organize your media content into folders however you please, read and respond to your email, post on Facebook or Twitter, or do whatever functions you typically do with Google Chrome when using your PC, smartphone, or tablet. Google TV also gives you access to Google Play, the Android Market app store where you can add more content-rich apps. The Vizio Co-Star already provides a nice selection of Internet content streaming services, including Netflix, Spotlight TV, Amazon Instant Video, Slacker, Pandora and Rhapsody, just to name a few. And more are added regularly; for instance, Vudu was added in a February 2013 software update. If you want to play video games, select the OnLive App and turn the remote sideways for an instant game controller. You can demo new releases or play video games from the cloud. This app essentially does away with the need for a video game console. As a word of caution, you really need good broadband speed, a minimum of 2Mbps, to have the best experience with online gaming. 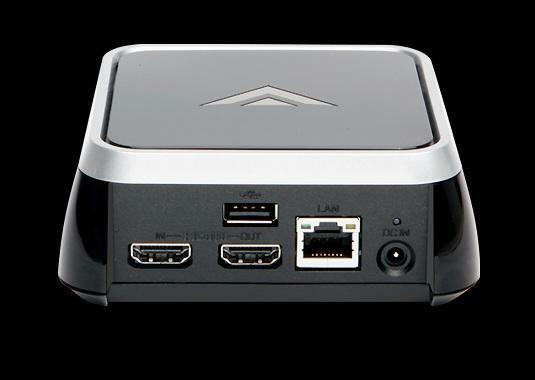 The back of the Vizio Co-Star media player shows how compact the HDMI, LAN and USB port connections are. The Vizio Co-Star with Google TV is manufactured by Vizio, an Irvine, California based company that specializes in high definition televisions and also makes stream players, personal computers, tablets, home audio electronics, routers and other media accessories. 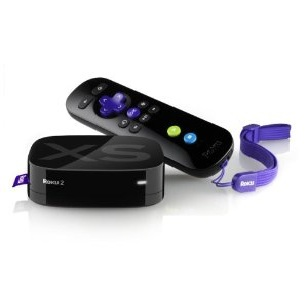 The Vizio Co-Star streamer was launched in June 2012 and is based on the Android Honeycomb platform. It features a dual core Marvell processor for faster response times. The Vizio TV media player is pocket-size, measuring 4.2 inches wide, 1.6 inches high, 4.2 inches in depth and weighs 0.66 pounds. The device’s universal remote has dual-sided functionality, complete with a QWERTY keyboard and touchpad. The remote features Bluetooth technology and an infrared (IR) blaster. The inputs, which are located on the back of the Vizio media player, include HDMI In, which connects to a cable or satellite box, HDMI Out, which connects to the TV, and a 2.0 USB port. The USB port can be used to connect a flash drive to access stored media content, or to connect a wireless USB adaptor, an OnLive game controller, a USB mouse or keyboard, or other compatible USB device. In terms of networking, the Co-Star has built-in Wi-Fi and accommodates 10/100Mbps Ethernet and Bluetooth. Its Web browser is Google Chrome with Adobe Flash Player and HTML 5. Network multimedia functionality is provided with the PlayPoint app for accessing media on DLNA-enabled network devices. In addition, the Vizio Co-Star’s graphic horsepower supports 3D viewing. The Search screen makes it easy to find viewing options; simply type in a keyword and select your preference from the search results. 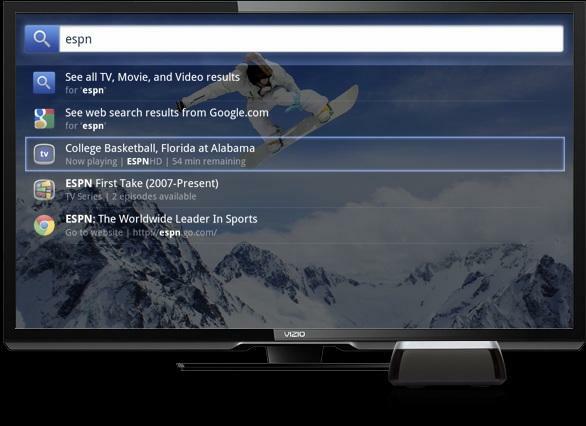 The VIZIO Co-Star stream player with Google TV is packed with features that enhance the TV viewing experience. One feature that distinguishes the Vizio streamer from other brands is its Live TV watching experience. 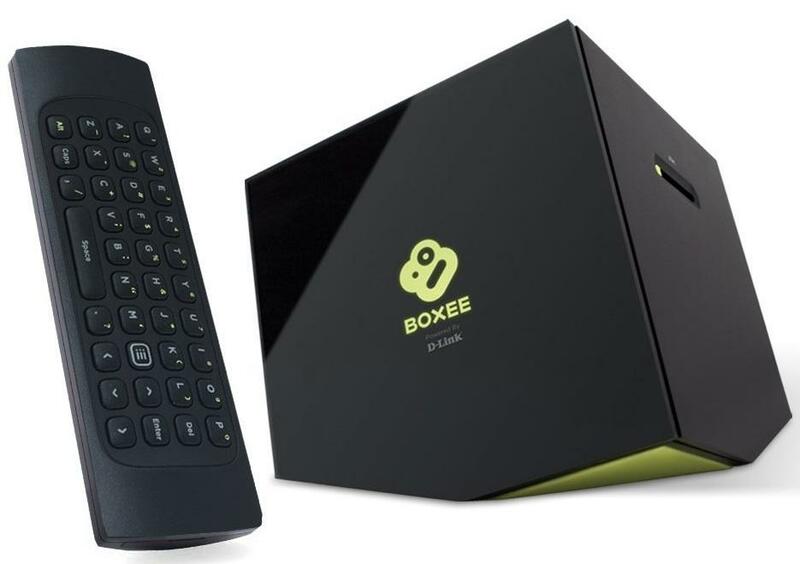 This allows the media player to connect to your HD cable or satellite receiver, merge your live TV, web and app options into one interface and simultaneously search across live TV, web and apps. Furthermore, the live TV integration features a picture-in-picture app so you can continue watching your programming while reading your email or searching the Web on the side of the screen. Another feature worth mentioning is the TV and Movies App, which intuitively recommends programming based on ratings you’ve given content you’ve already watched. Not only does this save you from searching, you’re introduced to movies or TV shows which match your viewing interest but had not been previously available to you via your cable or satellite provider. The app also lets you know when the programming will be on or if you need to rent or purchase it from a streaming content provider. Perhaps the best feature of this Vizio network media player is the way in which it merges live TV, streaming entertainment and home network content into one so you have a seamless user experience. It allows you to search content from live TV, apps and the Web and do so while watching something else on your TV. The VIZIO VAP430 retails for $99.99. The lowest online price was found so far on Amazon at $99.51, which includes free shipping. You can also purchase used units in good condition for around $86 on Amazon. The VIZIO Co-Star Stream Player With Google TV – VAP430 is available to purchase from Amazon (http://www.amazon.com/VIZIO-Co-Star-Stream-Player-Google/dp/B009IBX7Z2/ref=sr_1_1?ie=UTF8&qid=1364849173&sr=8-1&keywords=Vizio+Co-Star), as well as the Vizio store site (http://store.vizio.com/costar.html?SID=c5175icecropjl80mk6k367q32). Vizio also recommends these retailers: Amazon.com, Costco, Sam’s Club and Walmart. In addition to the wealth of reviews on Amazon, there are about a dozen reviews on the Vizio store website (http://store.vizio.com/costar.html?SID=c5175icecropjl80mk6k367q32). These reviews are not as current as Amazon’s and they are not as comprehensive as those written by those who purchased the device through Amazon.